In a large pot of boiling, salted water, cook the pasta until al dente. Drain, reserving 1 cup of the pasta cooking water, and transfer to a large serving bowl. In a large skillet, heat 2 Tbsp olive oil over high heat. Add the pork, red pepper, 1 tsp salt and 1/2 tsp black pepper and cook, stirring occasionally, until no longer pink, about 5 minutes. Add the mushrooms, garlic, and scallion whites and cook, stirring until softened, for 3 minutes. 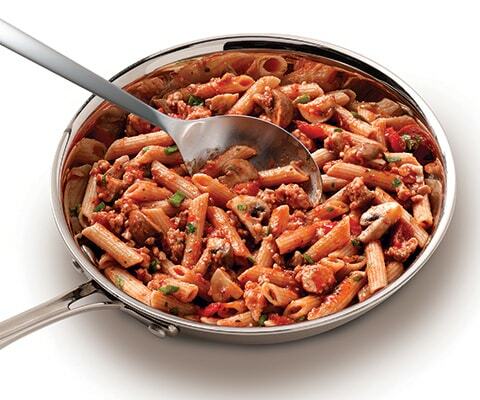 Lower the heat to medium, add Classico Tomato & Basil Pasta Sauce and reserved pasta water and simmer for 10 minutes. Pour sauce over the pasta; add the parsley, scallion greens and cheese and toss. Pass extra parmesan at the table.